In the ongoing battle against water weeds in the ponds, rivers, lakes and wetlands across the nation, there is always the temptation to turn to chemicals in order to get the upper hand. This is understandable, especially if you are facing a major infestation of any of the highly invasive water weeds we’ve written about in previous articles (Hydrilla, Eurasian Watermilfoil, Duckweed, Water Chestnut, Water Hyacinth, Phragmites, etc.). A big infestation can feel totally overwhelming. You look at a huge, dense mat of vegetation that looks like it would be impossible to remove. That’s when you’re likely to begin entertaining the idea of a chemical assault. You know it’s not ideal and you might even be worried about the impacts the chemicals will have on the ecosystem, but it feels like your only realistic option. One of the chemicals you’ll likely consider is copper sulfate. After all you’ve seen all kinds of information online about people who are using it and getting results, and also claims that it is safe to use. In this article, we’ll present a series of arguments againstthe use of copper sulfate. Everyone’s Using Copper Sulfate, so it Must be Safe, Right? This will do nothing about vegetation in your pond. That can only be controlled by chemical treatment at least once a year. Granular Copper Sulfate works pretty good. Either mix the granules with water in a bucket and then sprinkle the pond or put the granules in a gunny sack or any perforated sack and drag it behind a boat to dissolve it into the pond water. You can see how there is an assumption that chemicals must be used to stop aquatic plants, and the most common choice is copper sulfate, and even more so when the water body is suffering from serious algae or cyanobacteria blooms. When you see a sight like the one pictured above, you can bet what’s happening here is that copper sulfate is being sprayed onto or pumped into a pond to temporarily reduce the presence of algae, and is probably being paid for with tax dollars. The cause of the algae is most likely excess fertilizers used to keep the nearby grass green that find their way into the pond. Copper sulfate is considered by many to be nontoxic for humans, but that’s only because ingesting even a small amount immediately induces vomiting. 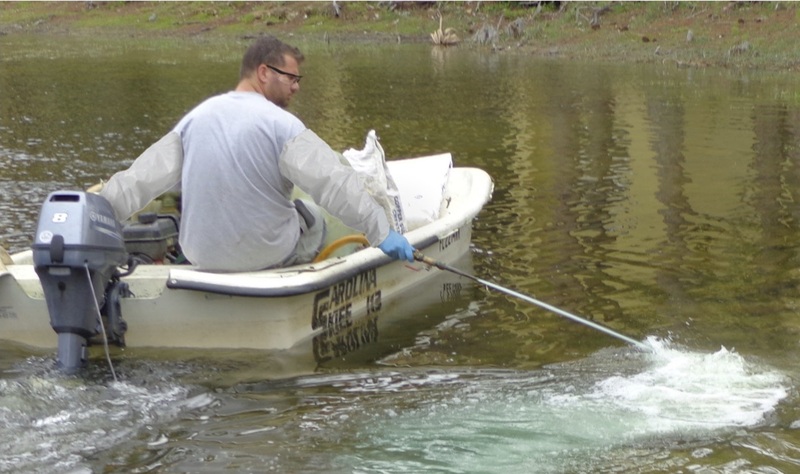 After spraying with copper sulfate, the algae will fall to the bottom of the pond in a few days – along with the heavy metals contained in the spray. Some aquatic creatures that call this pond home will survive, but many of the smaller organisms will die. And the heavy metal will remain in the water for decades. As noted by the Dartmouth Toxic Metals Superfund Research Program, “This chemical has serious chronic toxicity with implications for agricultural workers and the environment” (source). When copper sulfate is used on a water body, a surprising amount of it immediately sinks to the bottom, completely bypassing the plants it is meant to eliminate. Copper then has a chance to settle into the sediment, from there it is the slowly released back into the water. But that copper at the bottom is a real problem. First, it can combine with other substances in the sediment or in the water to form toxic compounds. Do you have any idea what substances are already in your water and sediment? Probably not. But the more immediate impact of copper in the sediment is on those creatures that interact the most with sediment – the bacteria, phytoplankton, mollusks, insects, and other organisms. Needless to say, these creatures are food for the next level up in the food chain. It’s also worth noting that this copper is highly toxic to amphibians. The copper moves up the food chain right into fish and bioaccumulates there, which means the copper can go on to have an impact on the creatures that feed on amphibians and fish, including humans. Chemical herbicides have been conclusively proven to have long-term, negative side effects. It is time to stop allowing our waterways to be poisoned. It is an undeniable fact that mechanical harvesting is the only truly safe way to remove aquatic weeds without destroying the environment, wildlife habitats, aquatic and amphibious life, not to mention causing harm to humans as well. 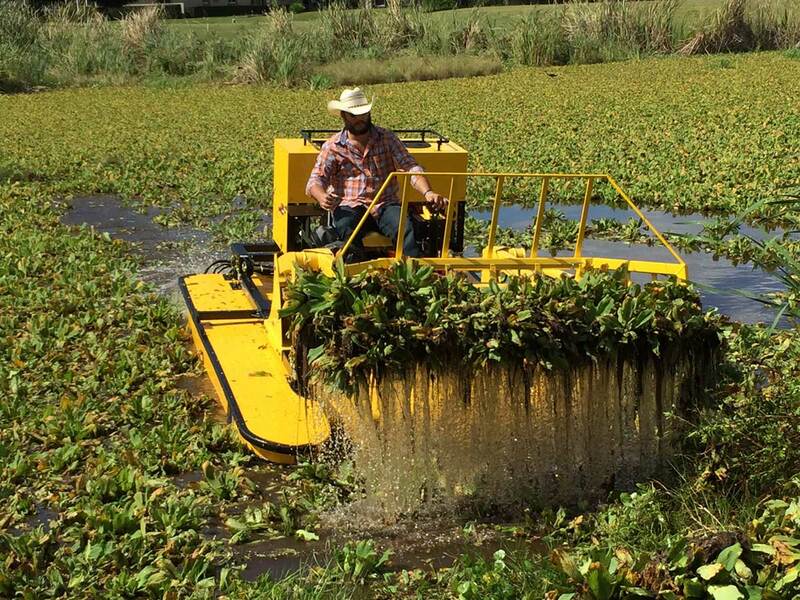 The Weedoo line of Workboats and Aquatic Weed Harvesting equipment represent the very best solution possible for the long-term goal of combating invasive and nuisance aquatic weeds. From easy-to-use electric skimmers to high-end hydraulic-powered underwater cutters and everything in between, Weedoo is the world’s foremost source for your waterway management needs. Contact us today to find out more! Many people try to solve their water weed problems with copper sulfate, thinking it is safe. Nothing could be further from the truth!